How did you first learn about post-graduate service? I was researching volunteer opportunities that would have given more meaning and purpose to the current comforts of living in San Francisco at the time. I came across the Catholic Volunteer Network website and the urgent request for teachers on an indian reservation in South Dakota, which is where I discovered the Red Cloud Indian School Volunteer Program. Little did I know at the time, it would change my life. 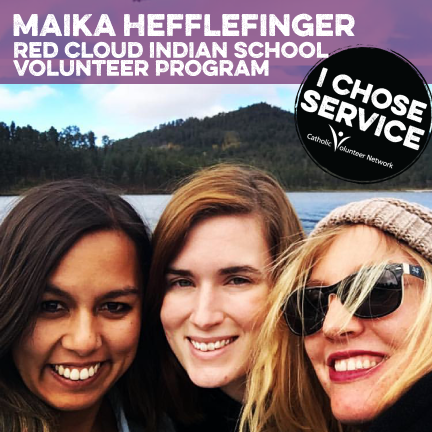 What other options were available to you, and why did you decide on serving with Red Cloud?After I learned about the program from the volunteer coordinator, Maka Clifford, I would have just a few days before I would need to decide if I would pursue this volunteer opportunity and put in my two-week notice at the health company I was working for in downtown San Francisco. I’ve always wanted to work on an indian reservation with having Cherokee roots myself, and after I found out how much need there was on Pine Ridge Reservation in South Dakota, with both the hardships of poverty and rural living, I wanted to join in Red Cloud’s mission as a Lakota and Jesuit Catholic School as a Middle School Math Teacher. Tell us about your volunteer experience. Initially with my background in Biology and Health, I was placed as a Middle School Science Teacher, but since rural teaching positions can be difficult to fill especially by teachers who are certified and with the first day of school fast-approaching, I was asked to help as a Math Teacher in the Middle School. Teaching math and the volunteer experience had it’s challenges, but many of which were outweighed by the daily reward of providing a safe and joyous space for the students to come and learn each day. Some of our students may face challenges in their home and personal lives, so to keep that in mind when teaching is so important in keeping your instruction, agenda, and affinity to control – flexible – depending on the day. What benefits have you gained from this experience that you might not have received otherwise? This experience has been life-changing and character-building. Through this experience, you truly learn TO GIVE to your students in the faculty of teaching, bussing them to and from school, facilitating after school programs, and maybe even coaching;. Additionally, you give to your house community through housekeeping and making a weekly meal alongside your greater volunteer community (22 volunteers this year and many more school staff) through support and encouragement in friendship. Living rurally and being in such a close-knit community at Red Cloud, I was able to develop spiritually and personally through attending daily mass, forming friendships with the Jesuit Fathers and Notre Dame, and experiencing the Lakota ceremonial traditions such as Sweat Lodge. Overall, this experience has really helped me to practice and make concrete the values of selflessness, community, and service as I look forward to the upcoming years. I’m very glad I decided to take time away from the city to experience South Dakota and the Red Cloud Community, and remember what truly matters – giving in friendship and community.